Furthermore, surgery can bring more than just physical scar tissue. The adjustments to one’s life post-operation can be incredibly challenging. Self-consciousness about appearance and fear of pain during movement are often just the tip of the somato-emotional iceberg. When my mom was diagnosed with breast cancer in 2003 I felt helpless, and so did she. It wasn’t until much later, when I was introduced to the self-care practices in Yoga Tune Up®, that I began to realize that she could be empowered to help herself feel better. This work has been transformative for her, even though she wasn’t introduced to it until over a decade after her diagnosis. It continues to be of positive benefit for the many patients with breast cancer with whom it has been shared. The information below is intended to help you feel less like a deer-in-the-headlights and more informed when a client discloses their breast cancer diagnosis to you. My intention is that for teachers or caretakers working with clients with breast cancer, this article (and the one that follows outlining common treatments and self-massage and movement practices to support healing) may offer a thoughtful place to start. However, as with any client be sure to obtain medical clearance for the modalities you intend to utilize. Going through breast cancer treatment is fatiguing. With this diagnosis, there might be a hearty amount of physical and emotional trauma for your client to work through. The best way you can support your client is to be as informed, compassionate and resourceful as possible. Being the caretaker can be a taxing role. It is crucial that you maintain your personal and professional boundaries and do not absorb the stress and sadness that a client may release in your presence. Most clients appreciate the sense of safety they get from a gentle and calming demeanor. Your compassion is usually appreciated, but your personal emotions may not be. Effectively working with breast cancer patients will require that you are able hold space for authenticity. This means be present, and have your own Sankalpa intact. A Sankalpa is like a personal “mantra” – it’s a chosen internal resolution or mindset that helps to positively reshape and influence one’s direction and purpose (definition from the Yoga Tune Up® Level 1 Teacher Training manual). When working with breast cancer patients, I will often choose a Sankalpa that’s simple and clear like: I create a safe space for healing. A biopsy marks the beginning of almost every woman’s breast cancer journey. A breast biopsy is a test that removes tissue or fluid from the suspicious area and tests it for breast cancer. The tissue trauma from the procedure is typically minimal, but the emotional stress can be significant. This is an excellent time for your student to enhance her proprioceptive relationship to her body through self-soothing therapy ball work. I suggest what is referred to in The Roll Model book as a ‘Freestyle Exploration’ of the Front, Back and Side Seams of the body using therapy balls. The ‘seams’ are continuous lines of fascia that connect seemingly distant body parts. “Working on one ‘seam’ will truly help you feel the interconnectedness of the fascias associated with that aspect of your body… Take each of these different ‘seams’ through progressive detangling, and feel the ease in your range of motion and pain reduction change after you roll.” (The Roll Model, P. 350). Another aspect of helping a person with breast cancer is figuring out what not to do. There are many side-effects that we are powerless to help with, but meeting your client where they are requires knowing how they feel. For instance, Lymphedema is a potential side effect of several breast cancer treatments. It comes with many possible complications and contraindications. The lymphatic system is an important network of nodes and vessels that carry lymphatic fluid (lymph) from the tissues of the body toward the heart. Surgery and radiation can cut off or damage some of these tissues. Over time, the flow of lymph can overwhelm the remaining pathways, eventually resulting in an accumulation of fluid in local tissues (edema). Lymphedema can appear during the months or even years after treatment ends. It usually occurs in the arm and hand. But sometimes it affects the breast, underarm, chest, trunk and/or back. Regarding prevention and management of lymphedema, there’s a good deal of conflicting advice out there. For self-massage and movement teachers, most therapy ball work would be contraindicated here, and exercises need to be specifically structured to meet the client’s fluctuating needs. 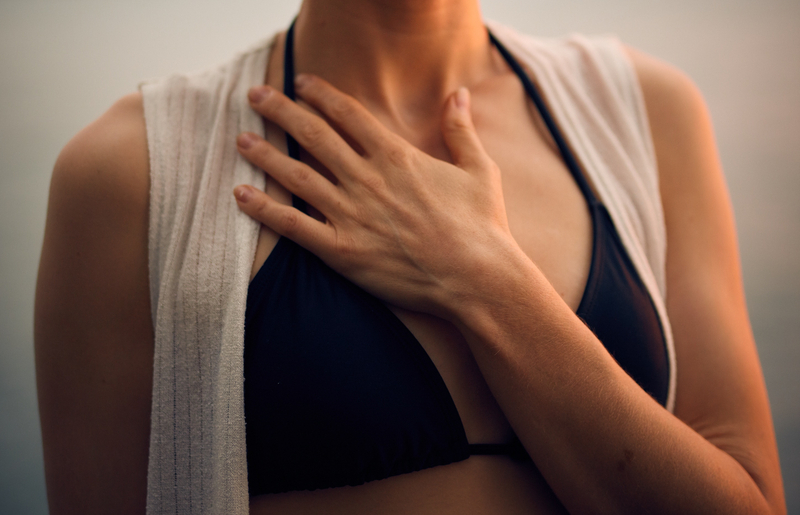 My advice, unless you happen to be an experienced lymphedema therapist, is to employ non-invasive techniques like breath practices that calm the nervous system such as abdominal breathing or sustained exhales. Every human is different, as is every cancer diagnosis and every course of treatment. Once you know your client personally, you can then get to know those condition-specific contraindications as well. For some clients, just creating a comprehensive Sankalpa and working to find the physiological space in which to embrace it is a significant feat. If you find your client is receptive, your first sessions can be devoted solely to that process. Understanding the basics of their body’s natural stress responses and having this simple mindset strategy to turn on the off-switch can be very empowering. I also recommend you have an updated list of qualified professionals to refer out to. Finally, be affordable. During treatment or due to disability afterwards, your clients may be unable to work. One of the biggest frustrations breast cancer patients reported to me was the inability to afford the very services they were being told could help them feel better. If you don’t have the means to volunteer your time, finding sponsorship can provide creative solutions so you can still offer affordable services to those in need. Find donors to cover the expenses of your workshops and sessions so that these clients can come at no-cost or a discounted rate can be doubly life-changing for them. Following this article I will be sharing another post outlining the specific treatments for breast cancer. Please tune in next week to learn those physiological details, along with specific self-massage and movement practices to support health and healing. This series has sparked so many ideas in me to further my practice with patients with a cancer diagnosis; hosting a seminar for patients and their families, get into the hospital and do some education on mindset, the opportunities for this work are so exponential! Creating material for this will be so fun and has got me excited to do some soul-provoking, physiotherapy/YTU combo to better my program! This was a great blog post. I love how you touched on many aspects of recovering from breast cancer. I am looking forward to integrating your tips into my treatments with patients. Thank you for this article and the other detailing the the different treatments. I have two family members who have had breast cancer and two different treatments! It’s great that you remind us to use Sankalpa in these situations and introduce the client to this also. I love that you point out the interconnectedness of the fascias and working with the balls can ‘detangle’ to aid range of motion. Great advice – for the novice and for the seasoned oncology worker. I have found lymphedema massage to be highly effective. Thank you for speaking to the emotional side and the role of a caretaker. I have always found it challenging to attempt to help clients who have serious illnesses, so I appreciate you reinforcing what I have found to be true about providing a compassionate place for them to experience the intense emotions. Thank you for posting this article, I found it very informative.I deal with cancer patients a lot and I help them choose their sankalpa, but I forget about my own. Thank you for the reminder. Thank you for this Riannon, i have clients with cancer and take the time to listen, but your article helped me to stay focus. The price of service as well, something lots of in service does not think about. Looking forward to your next article. This article touched me. My mother was also diagnosed with breast cancer a few years ago and I felt it was very hard to know how to help her. I feel just offering her a space to feel healthy and to be loved helped her tremendously. I know not everyone has that same experience so knowing that you can offer a sankalpa to help someone during this hard time can truly be a miracle. Thank you for sharing your advice and words on this extremely important topic. Thank you Riannon for your post. In the past several years, I’ve lost too many of my loved ones due to cancer & I’m taking this more seriously than ever, realizing it can happen to anyone, at anytime. This article helped me prepare myself better.